Available NOW on this superb Automower! 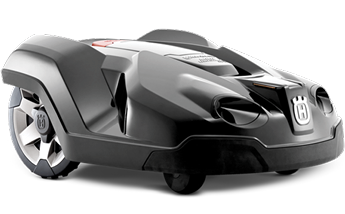 Large size robotic mower with generous inbuilt features. Equipped with GPS navigation for efficient mowing of various, demanding grass areas. Suitable for larger areas up to 3200 m² and can handle steep slopes with an incline of as much as 45% (24.5°). Smart technology adapts the amount of mowing to the lawn’s growth rate, enables spot mowing of a limited area of longer grass and guides the mower through narrow passages. The intuitive menu on the large, user-friendly display allows personal settings for when you’d like the machine to mow. An onboard GPS system creates a map of the garden, including where the boundary and guide wires are installed. Automower® will then register which parts of the garden it has covered and adjusts its mowing pattern accordingly. This will ensure optimized lawn coverage and an excellent cutting result. Thanks to its unique cutting system, Automower® works discreetly and quietly, when you want. Automatic charging When Automower® needs more power, it finds its own way back to the charging station. Automower® is equipped with an effective PIN code system, protecting the mower from theft.